When I was 19, I worked for a summer at a river outfitter’s in Bentonville, VA (a town so tiny pretty much all that’s there are a couple canoe/kayak/raft outfitters and a couple general stores) owned by a friend of the family, and lived at my parents’ cabin in Lebanon Church, VA (another “town” about the same size as Bentonville, consisting mostly of farms, a church, a post office–on Post Office Road, naturally–and a farm market). I’d turn right towards Wardensville, drive along Rt. 55, then split off onto Rt. 628, until I got to the mile-long gravel road that led to the cabin. It was the same route I’d driven, or been driven on, my entire life to get to our 20 acres out there, which my dad had owned since the 70s. But for some reason, during that summer I lived and worked in the area, I became enamored and mystified by Wardensville, WV. It was about five miles from the exit sign to the point where I split off onto Rt. 628 to get to the house, and about ten miles more on Rt. 55 to Wardensville if you didn’t make that split. But I realized I’d been driving past the sign for Wardensville my entire life and never went those extra 10 miles to get there. 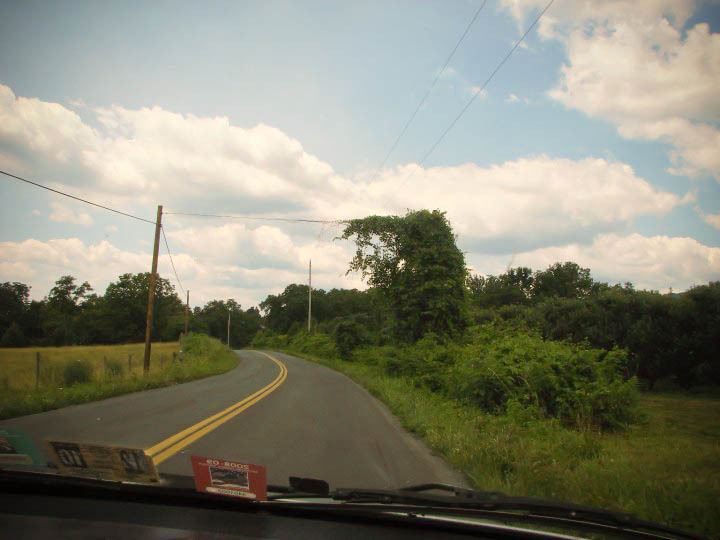 That summer, I just kept daydreaming about Wardensville, envisioning the kind of place it was and the people who lived there. It filled my thoughts, that one place out there I was sure would be waiting patiently for me with open arms whenever I made my way there. Until one night after a work, in what I think was a particularly turbulent 19-year-old time in my 19-year-old life back then, though I can’t remember exactly why, I passed the split-off for Rt. 628 and kept on 55, all the way to Wardensville. And when I got there it was…well, I don’t know. It was like any little blip of a Blue Ridge town (with no disrespect to Wardensville! I’m sure it’s a fine place), like countless others I’d seen, nothing distinctive about it at all. I don’t know what I was expecting, except for some idealistic place I’d imagined that encompassed every ideal of every place I wanted to be, and was home to people who represented everything I wished I was. So I drove home, made dinner, went to bed, and went to work the next morning as usual, with a certain veil pulled back from over a piece of the world, knowing a part of it I could never un-know. But the experience stuck with me, and this is the poem that resulted, in its final iteration, six years later. Monongah, Turkey Run, Star Tannery. have lingered over in my rearview mirror. lightly on the kitchen window panes. beam etched permanently on their faces. in hopes that they’ll take shape upon my tongue. richer wine, more summits beautifully bewildering. But only when their lengths remain within us. not light but stale, their shoulders but a shrug. but fragmented as flesh and blood can only be. swallowed by reflections of the sky. Shenan Prestwich is a Washington, DC-area poet and graduate of Johns Hopkins University’s MA in Writing program. Her work has appeared in publications such as Slow Trains, PigeonBike, Lines + Stars, Dirtflask, Dr. Hurley’s Snake Oil Cure, The Dead Mule School of Southern Literature, Orion headless, The Camel Saloon, and The Second Hump, Volume III, and she is a 2012 Best of the Net nominee. Besides writing, reading, hearing, watching, and sometimes tasting poetry, the wide array of things that make her happy include cognitive research, cameras, bluegrass, long drives, the great outdoors, good people, and bad karaoke.